We live in a plugged-in world. All around us we are constantly in contact with some sort of electronic device. I would love to say that this is just an adult problem but actually, children seem to have more electronic attachment issues! Between televisions, cell phones, video game systems, computers and who knows what else slowly we are becoming a society that prefers looking at a screen than an actual human beings face. So how do we break the plugged-in cycle that we have grown accustomed to and that we have taught our children to also be accustom to as well? Recently, my husband decided to take away all electronics. The only time laptops and such were allowed were during school time and for my virtual assistant work hours. I will admit, at first we struggled but we learned a few things as well. We had become too dependant on the electronic devices in our homes and we had stopped trying to connect with each other as much as we would like! Here are the ways that we unplugged and are making it work for our home. Go through detox: Electronics are addictive. So for a week, we had no electronics except for school and work. During those times we followed our schedule to the letter to make sure we stayed on track and focused. During that week we all felt a bit bored, to begin with. Toward the end, we were finding it very relaxing and therapeutic to simply all be together sitting outside while watching Xena and the chickens play. Remove temptation: We put blocks on our Facebook feeds so that we wouldn’t get sucked in and put our cell phones out of easy reach when we were home (we have a landline phone). This allowed us to not get easily sucked in by outside distractions. Find fun activities: Being unplugged doesn’t mean you have to sit around and look at paint dry. Instead, try out new board games, go for family walks, start a new family read aloud or pick up a new family project. The point is the funnier you make it the more likely it will be that your children will want it to stick! Allow for special plugged-in moments: Just because you want to be more unplugged doesn’t mean that as a family you can not enjoy a good movie night on occasion, your children can still play video games and we can even check our cell phones. What it means is that we are being more intention both with our screen time and our non-screen time. 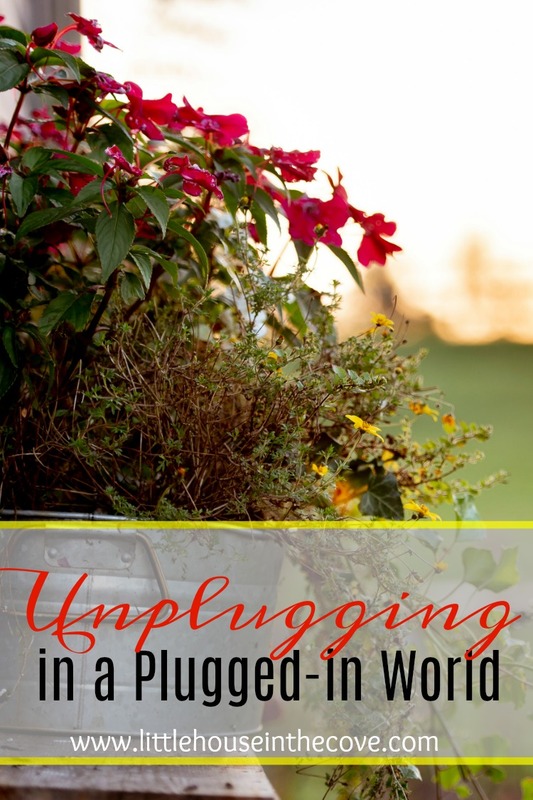 Becoming unplugged in a plugged-in world can seem a bit out of reach. However, it is possible. Not only will your electric bill thank you but your family will also (eventually).